Holbein's best known paintings is a who's who of the height of English society at that time, including the likes of Henry VIII, Sir Thomas More, Sir Thomas Wyatt, Jane Seymour and Anne of Cleves in his work. Hansholbein.net introduced to you 25 of his finest works and also discusses his influential career in great detail, tackling his works one-by-one. Hans Holbein was undoubtably a fine artist but his career also serves as an excellent visual guide for those looking to understand this period of English history and put some faces to the names that they have been learning all about. Henry VIII himself is the biggest name of this period and his own portraits have proven extremely popular in recent years with fine art print or poster reproductions of them being very common for fans of his work who can be found in Europe and North America in the main. You can find Holbein Henry VIII portrait paintings here with all the different ones included. Ambassadors is the most memorable of art works from Holbein other than his series on Henry VIII and you can see it above. Ambassadors is available from the links provided as a fine art print reproduction from recommended art retailer, Art.com who also offer stretched canvases and posters of original Hans Holbein the Younger paintings. There is a great selection available from the gallery that is also linked to above and throughout this website which aims to offer you information on where best to buy Holbein reproductions. The Holbein painters are interesting and unusual in that despite their obvious German nationality they are now very much better known in the UK because of how they produced portraits of the Monarchy which at that time represented England and there was no Britain as such. This is not the only case of an artist who has made his name abroad, with Englishman Alfred Sisley one example, after making his reputation from French impressionist painting which led to him being much more comfortable across the English Channel in France than his own birthplace. Many have argued that Holbein's style was influenced by Dieric Bouts, Jan van Eyck, Hans Memling and Quentin Metsys, all from Northern Europe in the German and Netherlandish regions. Sir Thomas More was an integral figure behind the scenes of the ruling Monarchy during the time of Holbein the Younger's career and so it was almost inevitable that he would become a subject within a Holbein painting at some stage. The painting above is the best portrait that Holbein produced of Sir Thomas More, but there were many others which are also worthy of study. It is always interesting to historians to see how key individuals have been captured by any artist and these paintings can often offer great further clues as to the personality and standing of each individual. King Henry VIII was one of the most important leaders of the English Monarchy and also boasted one of the strongest personalities of any King with a bold attitude which can be seen in many of his portraits that were created by Holbein who was an artist that the King was known to appreciate and this was backed up by the large number of times that Holbein was commissioned to paint the King over an extended period of time. Holbein spent time on both full length works and also simpler head portraits of Henry and they all came later in the reign of this memorable king by which time his handsome young looks had long since past, partly due to the effect of natural age and partly due to an accident that he experienced earlier in his reign at a time when Holbein was still building a reputation as an artist and had yet to make his mark. King Henry VIII was a hugely powerful character who would not have accepted services of any kind that he was not happy with and so would have been a hard customer to please for any artist chosen to produce a portrait of him. It is impressive that Holbein could some how create works that pleased him and remained unchanged when most other artists probably would have run into problems. It is likely the this painter's own self confidence may have helped to get his work appreciated and also ensure future commissions were forthcoming. Perhaps the King appreciated the openess and directness of this German painter and saw some likeness to his own brash character which successfully ran the country through a turbulent period. Jane Seymour was a famous wife of King Henry VIII and also received a commissioned portrait from Hans Holbein. Her portrait is shown above and offers an interesting insight into a key part of Henry's life as he went about protecting his reign by trying to produce a series of sons who could take over from him. This obsession caused great frictions in his life and was the cause of his constant re-marrying. This part of the King's life has been studied in exceptional detail and as such portraits of his wives such as Jane Seymour are extremely helpful in helping us to understand more about each of them. Anne of Cleves was another of King Henry VIII's wives, and her best known portrait from Holbein is included above. In all there were six wives and each have played their part in the complicated dealings of the English Monarchy at this time. Holbein managed to capture each of the wives that he painted in a personal style that helps historians to compare each that he documented. There still remains some doubt as to who organised Holbein to produce each portrait of the wives but his success in portraying the King would have put him at the top of the list of suitable candidates to cover all the other major political figures around that time. Henry VII portraits are continued directly above with another included. There was a whole series from Holbein in total, all produced several years apart and serving as a visual diary to the progress of this national figurehead who made many changes to the country which are still very much felt today, many centuries later. For those looking to learn more about the artist's list of paintings, or even buy their own copies as an art print, poster or stretched canvas, please see the list at the bottom of the page which includes all of his notable contributions to the European art scene of that time. John Fisher Bishop of Rochester was another influential nobleman during that time and his portrait can be found above. Such people would feel that using the same painter that the King used would immediately make their status appear more important and their own portraits would always be hung in their own residence, often somewhere in the countryside. Families of that era would use these portraits to serve as a record of the long history of success within their own families who would have built up large amounts of wealth over several generations through a variety of means. Further on from those listed above there are more Holbein pictures included below as well as this comprehensive list of famous oil paintings from the career of Hans Holbein the Younger. 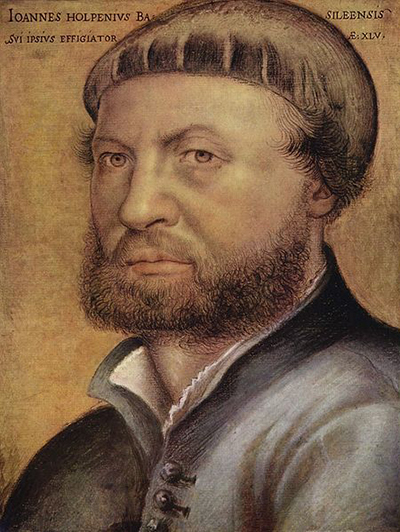 Disclaimer: www.HansHolbein.net is a personal website covering the career of famous German painter Hans Holbein the Younger, but is in no way an official website for Hans Holbein and HansHolbein.net does not claim to be that in any way. The Estate of Hans Holbein and their presence hold all necessary copyrights and licences for all of his paintings and other works. All prints, paintings and photos included in HansHolbein.net are provided as an affiliate to Art.com who hold necessary permissions. Art.com pay us small commissions based on any prints or paintings that you buy as a result of using this website.